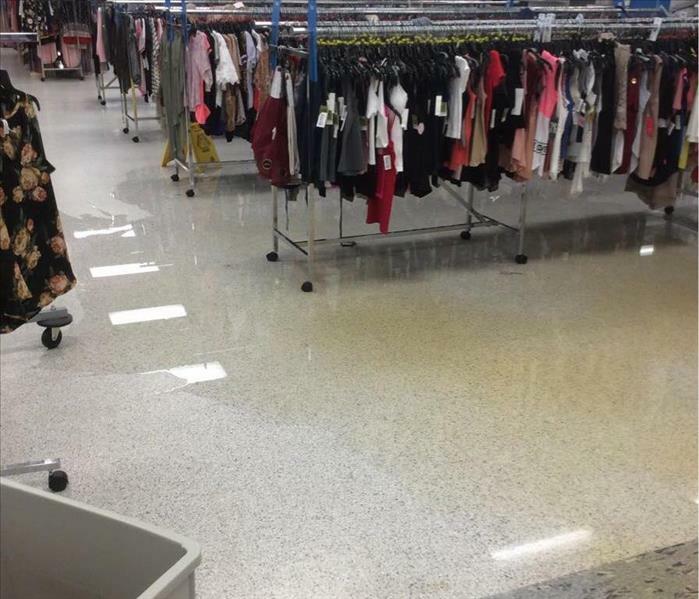 This Columbia, SC store discovered a pretty major water leak as they were closing one evening. Our staff was able to tell the manager where to shut the water off in order to prevent any further damage. Our technicians arrived within the hour and were able to get all standing water extracted. Our trucks carry most all equipment we need so they were also able to setup drying equipment prior to leaving. After a few days of monitoring and our drying equipment running, the store looked "Like it never even happened." This photo was not taken in Dracula's Vampire Palace and it certainly wasn't close to Halloween when a spooky cobweb is a common sight. Fires are not only destructive to the structure they consume but they're also a health hazard. Smoke is the leading cause of fire deaths, exceeding burns by a three-to-one ratio. Direct exposure to smoke is harmful to your respiratory system which gives us grounds to advise homeowners to get out fast and avoid contact with the structure if at all possible. These cobweb-like shapes appear when plastics burn, the smoke carries a stronger ion charge than when wood, cotton or paper burns. 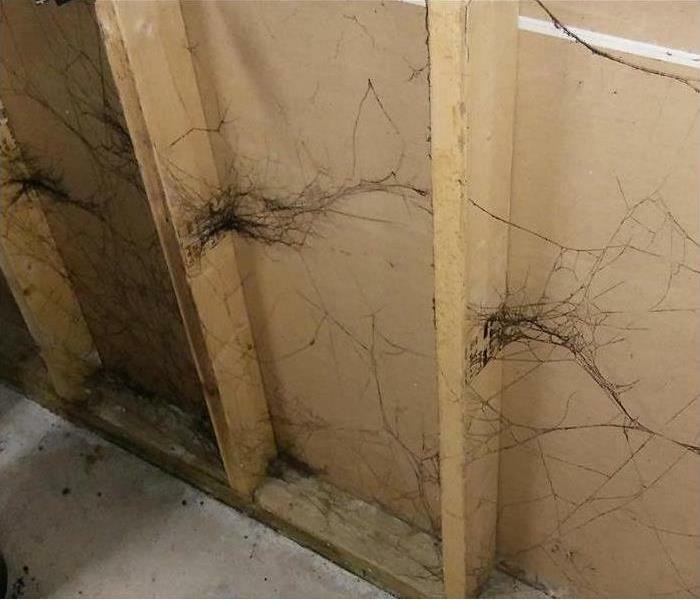 Sometimes, this causes smoke residue to form “smoke webs” where the walls and ceiling come together. After a severe thunderstorm, we received a call from a homeowner in Chapin, SC that had a neighbor's tree fall on the corner of their home. In the middle of the night there's not much a homeowner can do in cases like this. Because of limited visibility and loss of power, it seemed the only thing to do is wait. SERVPRO of The Dutch Fork arrived to find the tree resting on the roof of the home. The weight of the trunk caused what appeared to be minor damage. It was not until we got inside the home that we found portions of the ceiling caved in and water spots showing in several rooms from rain water that seeped in through holes caused by the tree. After the tree was removed, the roof had a tarp placed over it and demo began. 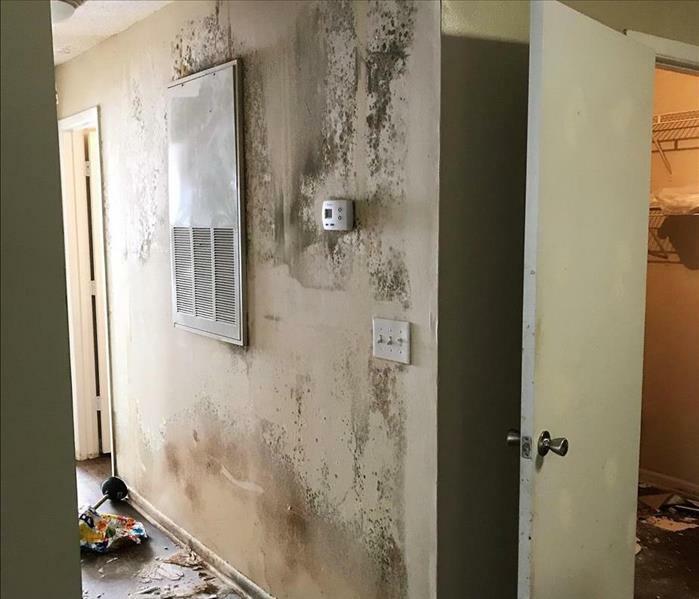 It's not uncommon for us to get calls with stories of water damage occurrences where the homeowner or property manager attempted to fix the problem themselves. Now the issue is far worse than they had imagined! In this apartment, an attempt was made to clean up a water leak from the unit above. The water was successfully removed but proper drying was not performed which resulted in mold growth. 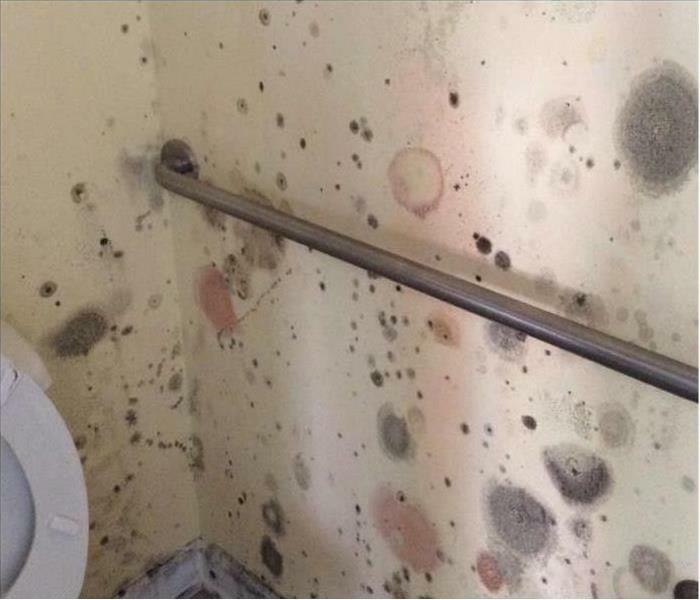 A tremendous amount of mold growth, and a very costly fix. This all could have been avoided with a call to SERVPRO when the water damage was found! 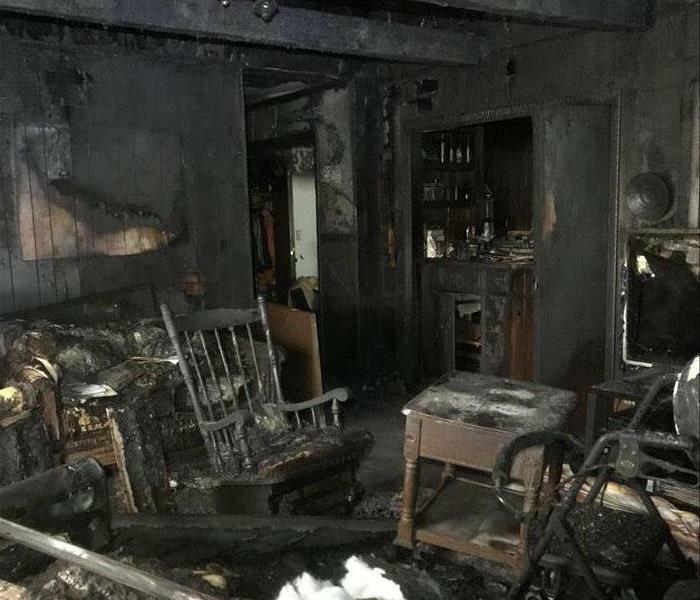 This home fire began in the living room and spread to the kitchen before it was extinguished by first responders. As you can see, the contents are covered in soot, debris and some are water damaged from the efforts to extinguish the fire. 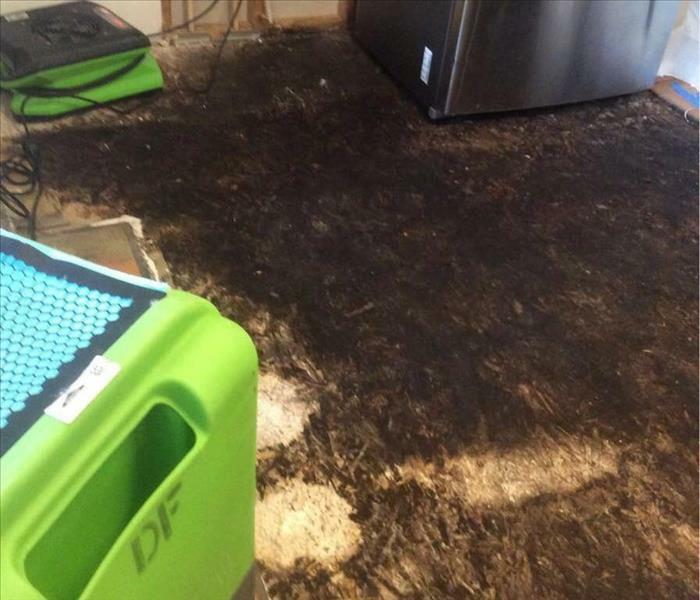 SERVPRO of The Dutch Fork is capable of cleaning and restoring household items that have been damaged by fire and smoke. In an instance like this, we pack all of the salvageable belongings up and bring them into our facility where they will be cleaned and restored. We work with the homeowner as well as the insurance company to decide if items are in fact salvageable. At SERVPRO we like to approach any content damage with a "repair rather than replace" mentality and return as many of the homeowners belongings to them as possible. 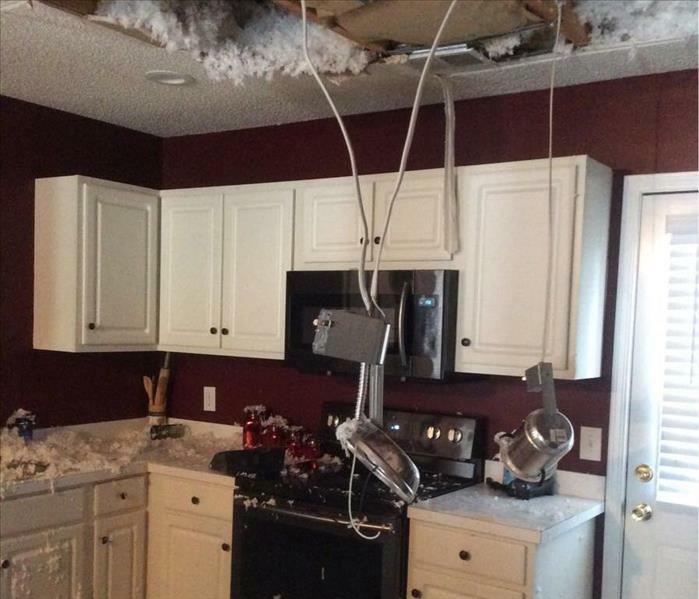 What began as a water damage loss due to a leaking ice maker became much more serious. After removal of the flooring it was discovered that water had been leaking for longer than the homeowner was aware of. This lingering moisture caused black mold to consume the sub-flooring in the kitchen area. A cold front moving in caused temperatures to drop below freezing. Unfortunately this home was not prepared for the winter season. A water line burst in the ceiling which allowed water to flood through the ceiling into all of the rooms below. Pictured is the kitchen that required the removal of all of the ceiling as well as flooring below. During the night this Chapin, SC home experienced a leaking toilet. The water was not discovered until the morning when it had spread throughout the first story of the home. 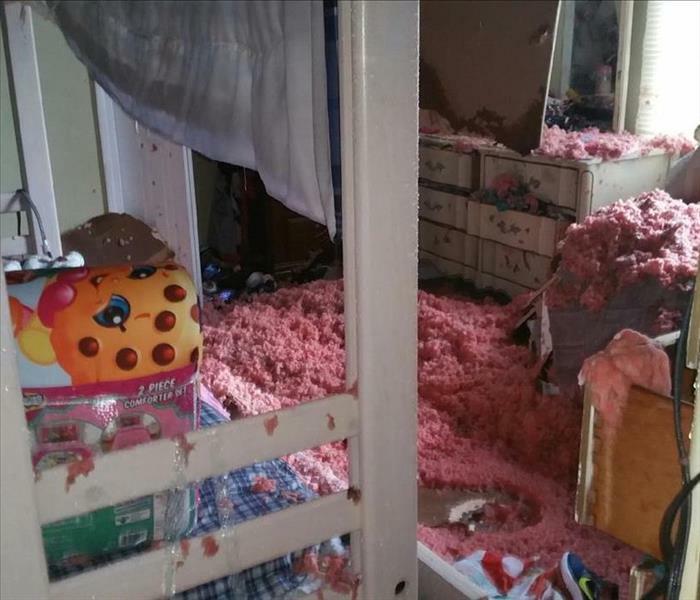 The homeowner called SERVPRO immediately after contacting their insurance agent. 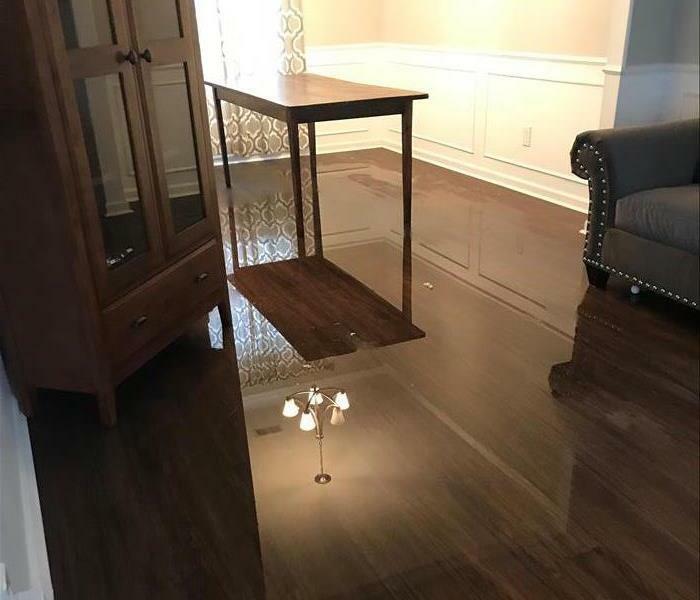 This photo was taken in the living room, the floors have an inch of standing water in most areas that had begun to affect the furniture and other contents. The first step taken in any water damage is to extract the water and salvage the contents of the home. If we're unable to move furniture out of the home we place it on blocks to prevent further damage and begin the drying process. This Irmo, South Carolina pool house became a mold spore breeding ground in a just a matter of days. The homeowner discovered water leaking from the toilet and promptly shut the supply line off. Although the visible water was removed using towels and mops, there is almost always hidden moisture where the eye cannot see. Life can be hectic, we all have schedules to keep up and plenty of things to do. Unfortunately life got in the way at this property, causing the homeowner to close the pool house and worry about it later. Later proved to be costly for this water damaged home. 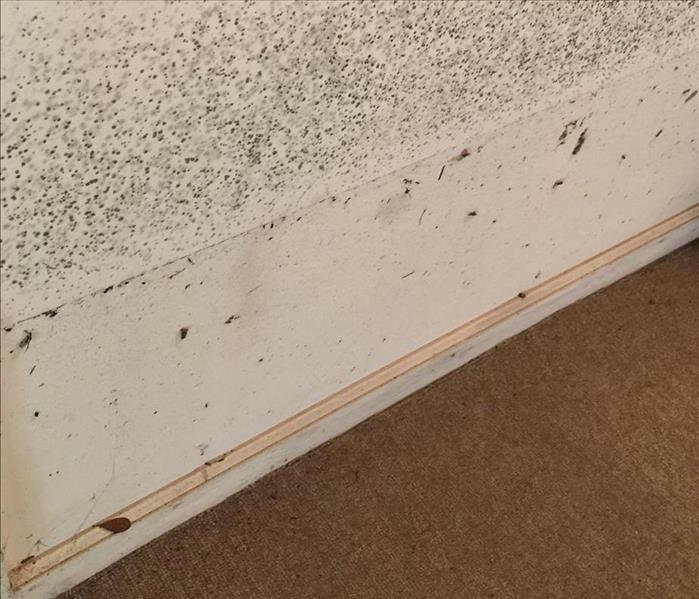 The unseen moisture prompted mold to consume the majority of the drywall. Luckily the homeowners next call was to SERVPRO. We were able to treat the pool house to remove and prevent future mold growth. When temperatures drop burst pipes become a common problem. Pipes line walls and ceilings and can cause immense amounts of damage requiring extensive renovations. Be sure your home is winterized! 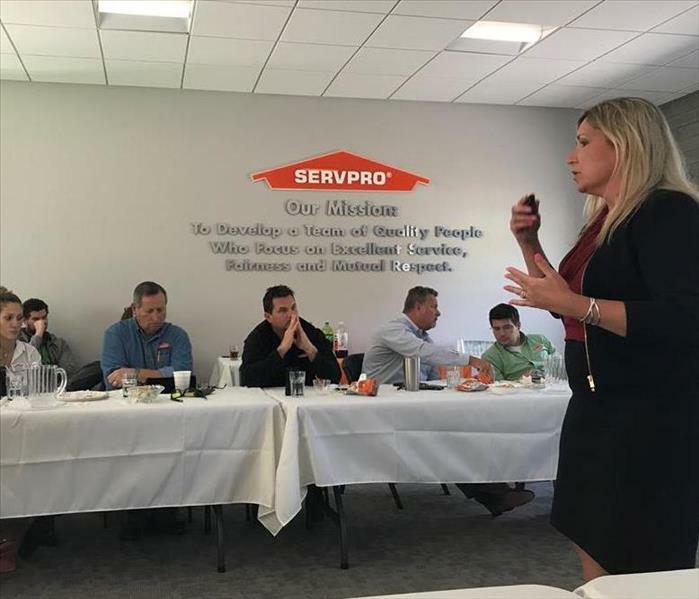 SERVPRO regularly hosts meetings, classes and training sessions for a variety of industries. We host a state-of-the-art conference room that allows us to bring in groups for any sort of continued education. Business of all sorts find our space useful to train, certify and gather! Hurricane Florence took a devastating toll on Eastern North Carolina. Sudden changes in the storm's path left many unprepared for the amount of water and wind that would ultimately devastate a concentrated area of the east coast. Our crews loaded up and headed to Hampstead, NC to assist the local SERVPRO Franchises. Water consumed 75% of the lower level of this home. Thankfully there were no occupants on the premises during the worst parts of the flooding. Flooding not only causes safety hazards - storm water is a breeding ground for bacteria and can cause a number of serious illnesses. During Hurricane Florence our SERVPRO team traveled to North Carolina to assist in storm relief. One home we entered showed signs of improper remediation. When water comes in contact with drywall, it needs to be removed. At this home, the drywall was left intact even though more than a foot of water was standing in the basement. 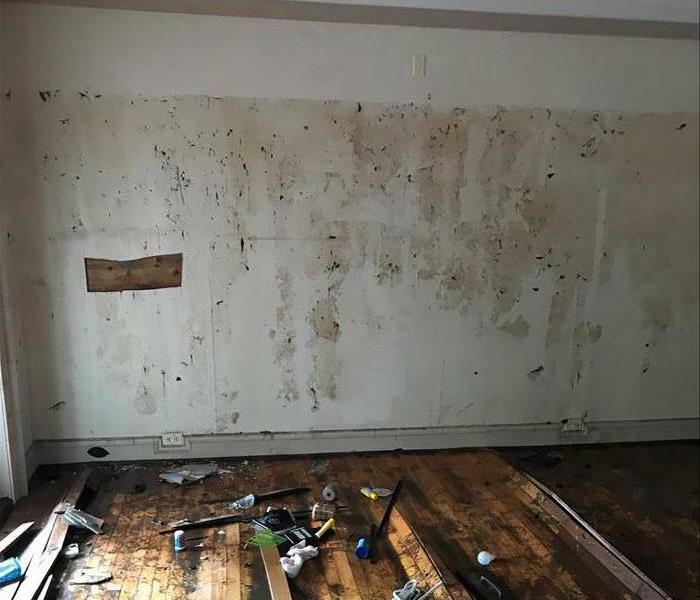 Just above the water level line you see a tremendous amount of mold growth that required us to remove much more of the wall than what would have been needed if SERVPRO was the first to this disaster. Because drywall is porous, it absorbs liquids and can begin to show signs of mold growth in as little as 24 hours. Flooring Damage? We Can Handle It! 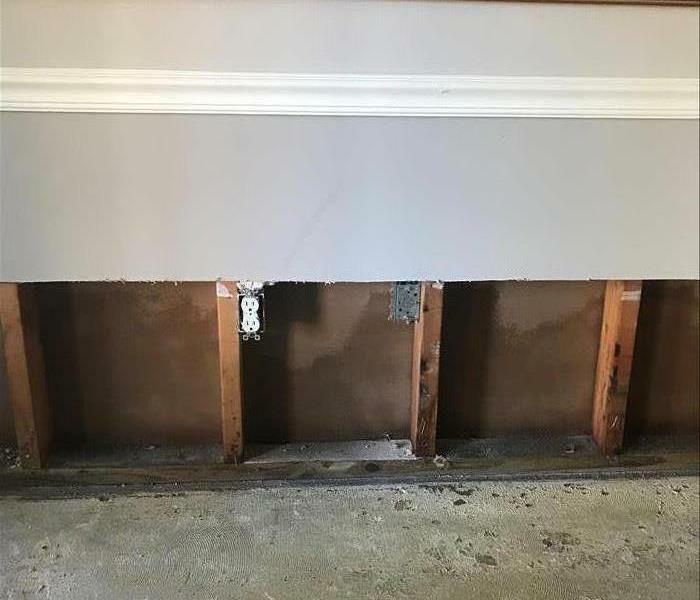 Whether you've just discovered your flooring to be water damaged or you've noticed some warped boards for quite some time, SERVPRO of The Dutch Fork is ready to help! When faced with property damage you typically have two choices - to repair or replace. 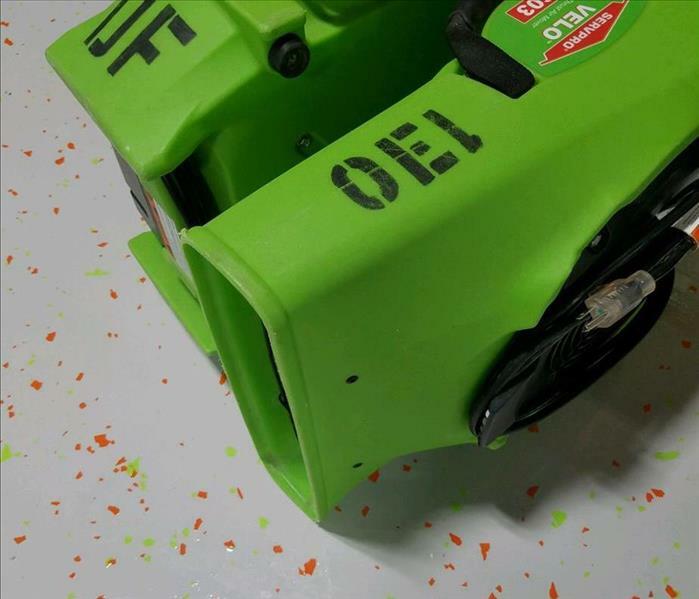 While we cannot guarantee that everything can be restored or repaired 100% of the time, SERVPRO prefers to clean and repair any contents affected in the home. In instances where demolition and reconstruction are required, SERVPRO of The Dutch Fork is willing and able to help. We have the capabilities to see a project through from beginning to end. 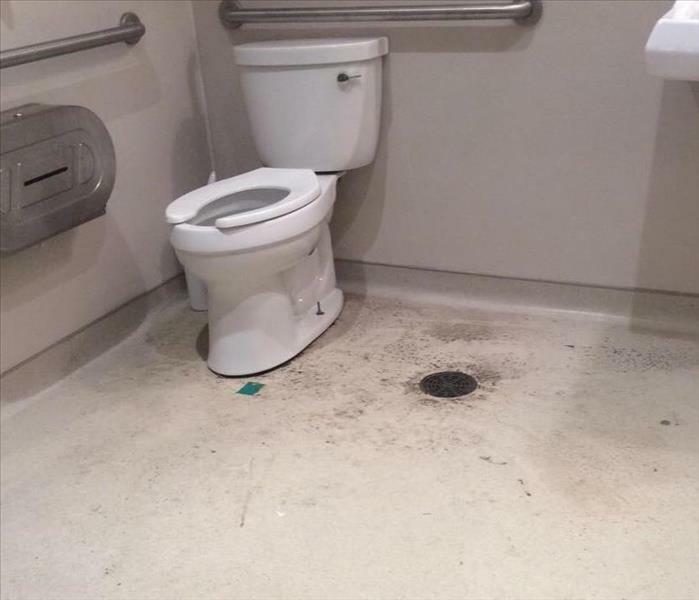 This is the aftermath of a sewage backup in a Columbia, SC mall bathroom. During the holiday season shopping centers are full of customers and sales are at their peak. A setback like this can cost a business dearly. Sewage water can contain harmful bacteria and should be treated only by professionals. Do not attempt to clean sewage yourself, that can increase the possibility of a more serious restoration process. Our SERVPRO technicians had the blockage resolved and the bathrooms in working order in a matter of hours. With any commercial property loss we face a few more challenges than those of a residential property loss. There are employees, customers, clients, and even patients we must be considerate of! SERVPRO of The Dutch Fork responded to a water loss, the result of a supply line burst in the kitchen area of a local dentist office. 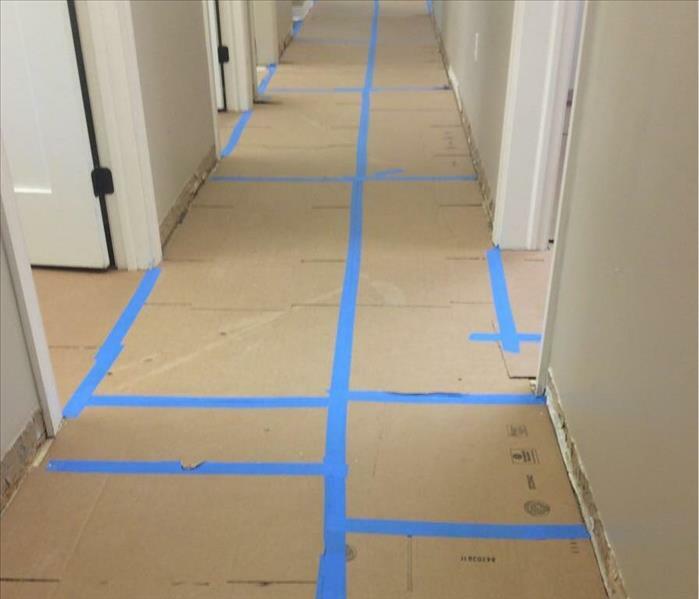 Our techs determined that the flooring would need to be removed in order to get all affected areas dry. Because there are patients scheduled regularly throughout the day we needed to work flexibly and resolve all issues promptly. We provided temporary flooring so that the office could continue business as usual until we were able to completely restore the damaged areas. In August of 2017 Irma struck the southeastern United States as well as several coastal islands off the Atlantic. Because of its magnitude many were forced to evacuate the area and leave their homes behind. Our storm crews set out to Fripp Island, SC to assist those in need. In this home there were several inches of standing water that caused damage to the lower level of the home. Water had to be extracted to further asses the damage. Our trained technicians determined that at one point water had accumulated over a foot in the living room. 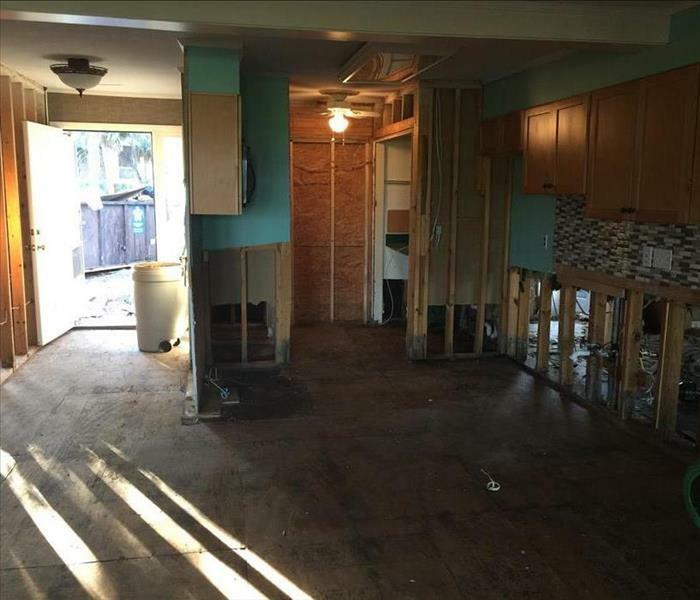 Because of the harmful nature of storm water it was necessary to remove and clean all contents of the home, remove and dispose of the flooring, and remove the drywall where water had contact. The North Pole is always busy this time of year - there are toys to be made, reindeer to be fed and lists being checked twice! With a winter wonderland that works around the clock all season long, who has time to make sure all of those snowy footprints are kept outside?! Even the tiniest elf feet can create a super-sized mess, and it takes a special crew to handle such a jolly job. Mr. and Mrs. Claus trust the professionals at SERVPRO to keep the North Pole carpets in tip top shape throughout the year, but SERVPRO of The Dutch Fork has an even more special assignment! Santa flies to Columbiana Centre every day until Christmas to visit and take pictures with boys and girls in The Midlands of South Carolina. Santa selected SERVPRO of The Dutch Fork to make sure that his Winter Wonderland is just as clean as The North Pole. Our professionally trained technicians keep his carpets and comfy chair stain and odor free all season long! 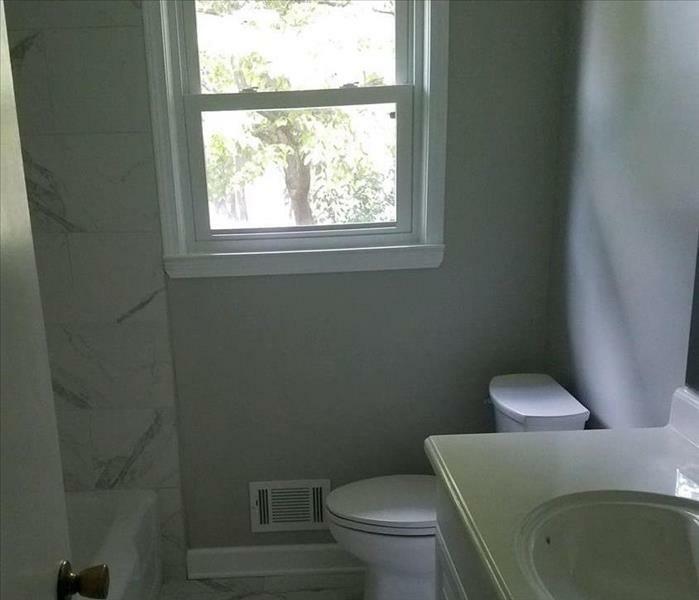 We were able to completely restore this St. Andrews bathroom to our customers satisfaction. We pride ourselves on working with our customers to insure that they get what they want when we are restoring their property. 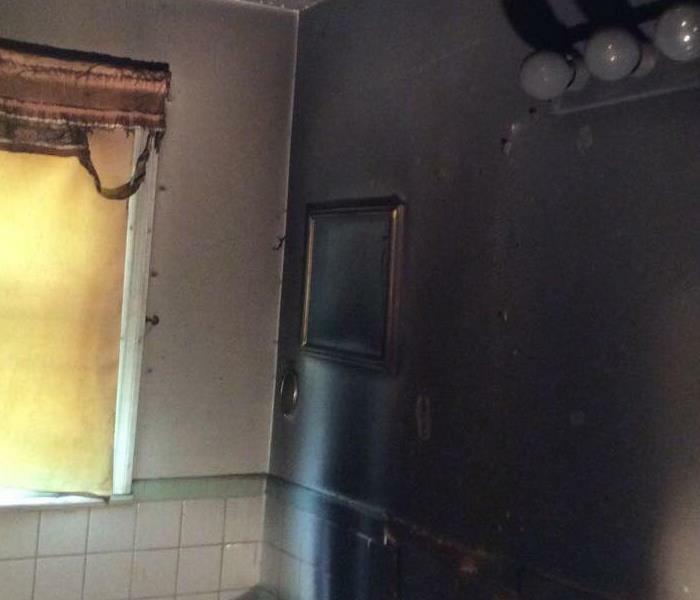 This fire was caused by a candle and the fire effected the whole house. SERVPRO of The Dutch Fork responded quickly and when we left it was "Like it never even happened." 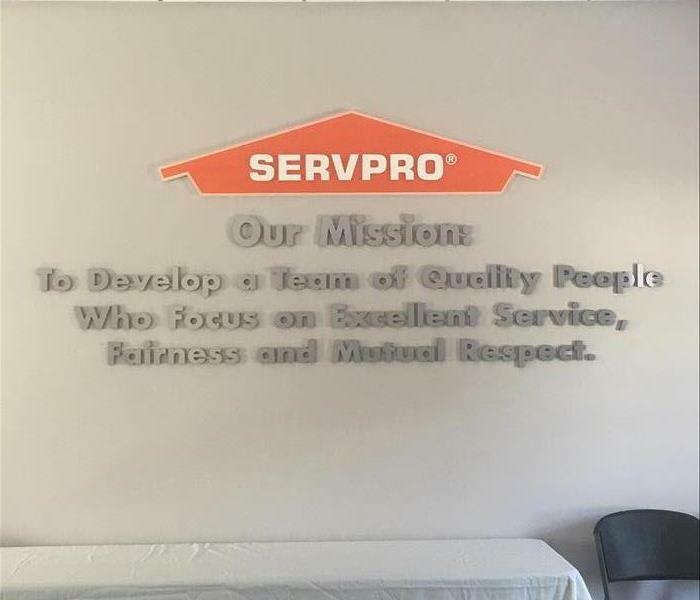 Our Mission at SERVPRO of The Dutch Fork, is "To Develop a Team of Quality People Who Focus on Excellent Service, Fairness and Mutual Respect." We have this Mission Statement on our conference room wall. This serves as a constant reminder during our daily morning meetings. Hurricane Matthew was the first Category 5 Atlantic Hurricane to pass through the United States in 10 years. Matthew caused widespread devastation in the southeastern United States as well as coastal islands. SERVPRO of The Dutch Fork loaded up our hardworking crews and headed to Fripp Island, SC. In one home we mitigated there was over 2 feet of standing water. This required removal of all flooring, the majority of the drywall and contents in the home. Storm damage of this caliber requires trained professionals to remediate - if proper precautions are not taken, further issues can be expected down the road. We are in the process of renovating our new office and warehouse! Our new warehouse is coming together! Check out our Orange and Green speckled floor! Our new warehouse has given us much more space to organize and store our equipment. SERVPRO of The Dutch Fork is in the process of renovating our new location. We are so excited to have our production staff moved into the new warehouse! 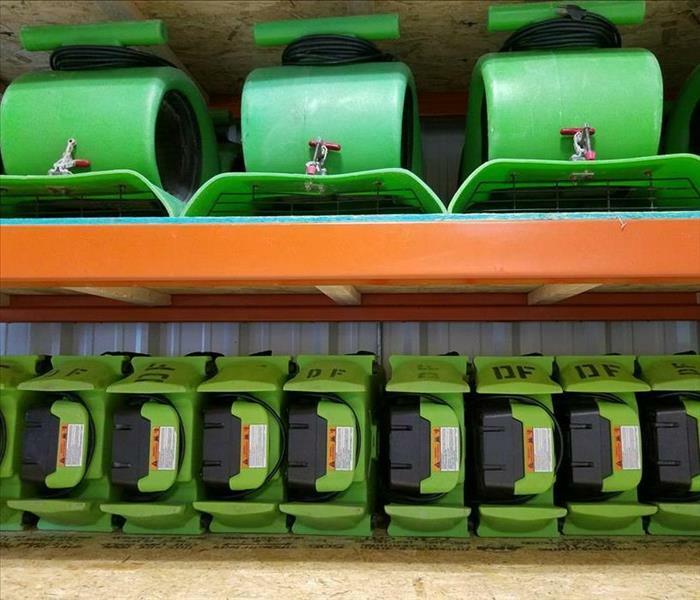 We've got our air movers organized and ready for the next water damage emergency.